How do companies like Amazon maintain such a huge market share and keep their prices low without losing profits? So what is a high-runner strategy, and is it the right pricing strategy for you? In this post we’ll give you a short introduction to the high-runner strategy, then help you figure out if it’s the right option for you. 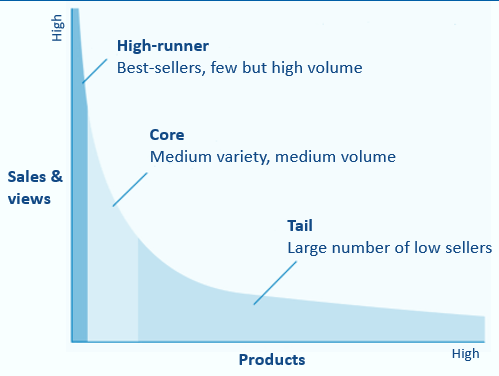 A high-runner product is another term for the top-performing products in your store. These are the products that have the highest numbers of views, clicks, and purchases, and which are eagerly sought after by the public. They are generally highly elastic and extremely sensitive to market price changes. 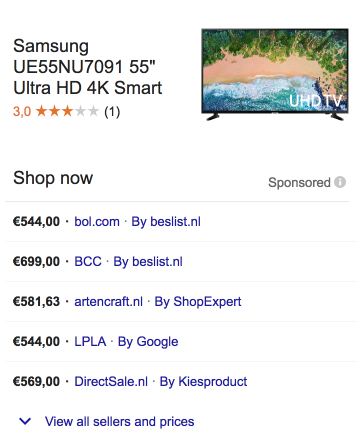 Take a look at the example search for a Samsung TV— which listing do you think consumers will click on first? Most consumers will choose the cheapest option — in this case the €544 TV. The other retailers are severely overpriced for this product, even if they’re only priced 4.59% (€25) higher than the lowest competitor. With a high-runner strategy you discount heavily on these high-visibility products to increase the number of clicks to your site. This increases the amount of traffic on your site as well as the number of sales on that product. This is just the first step of the process though, and if you did this for every product in your assortment you’d end up losing money on margins. That’s why the beauty of this strategy lies in what you do with the increased traffic. Once you have this traffic on your site, present consumers with up-sells and cross-sells on inelastic products at full price. This is where you make your margins. Going back to our television example, retailers could show customers a wall mount and an HDMI cable as add-ons during the checkout process. Many consumers who are already spending €544+ on a television won’t think twice about these products or stop to compare your prices to the competition. Instead, they’ll go ahead and add them to their cart and pay for the convenience of a packaged delivery. They’re also paying for the assurance that the products work well together so they won’t need to go through the hassle of returning a defunct product. Another way to use the high-runner strategy is to drive consumer perception about your store. This is Amazon’s strategy, and it’s partially what’s responsible for the company's global growth. If you consistently advertise yourself as the lowest price on a variety of high-visibility items, consumers will associate your store with low prices but high-quality products. As a result, you’ll become their default store for any of their needs in your niche and increase their loyalty to your store. Amazon has asserted itself as a one-stop-shop for almost any product a consumer needs. But if you look at its actual prices, many of its products are competitively priced with the rest of the market. The same is also true in reverse, and it has an even bigger effect. If you’re overpriced on a product consumer loyalty will shrink. 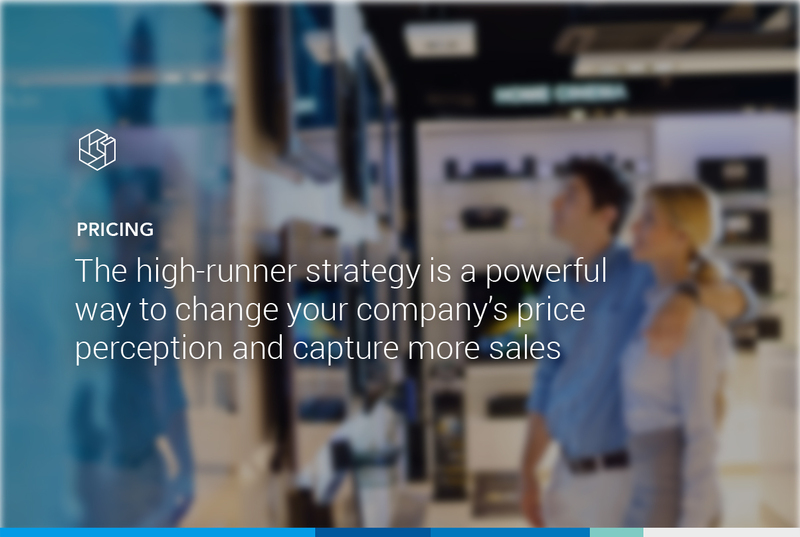 The high-runner strategy is a powerful way to change your company’s price perception and capture more sales. When done correctly, it’s an effective way to drive customer loyalty and increase profits through cross-sells and up-sells. But it’s not the right strategy for every retailer. If you want the public to see you as a top-of-the-line retailer with high prices, then this is not the strategy for you. Instead, you might want to charge premium prices as a sign post for your product’s quality. If the high-runner strategy is right for your business, you need a tool to help you manage prices and ensure that you stay competitive. Omnia’s suite of pricing and online marketing tools help you keep track of your products and automatically adjust prices and bids so you are always priced according to your strategy. Want to learn more? Request a demo today to get in contact with our sales team.